Gumtree has listings for free items that people are just trying to get rid of. Your child could take it off of their hands, and then resell it on Gumtree for a profit. This should always be done under parent supervision. They'll probably need you to help transport the item, anyways. This method is pure profit. Unless, of course, you really want to give them a lesson. You could charge them for petrol in order to teach them about overhead costs. It's amazing to me to see kids who can do effortlessly what my peers had to go to college to learn, simply because they've grown up with technology. Graphic design is one of these areas. Photo editing, logo design, and more can be done completely on-line by freelancing or selling their services on a site such as Fiverr. Much like graphic design, this is another field that amazes me. I wouldn't even know where to begin on this one, but so many kids do, armed with the technological know-how and the creativity of youth. Like the Sydney teen Ben Pasternak whose popular app Impossible Launch now has him job shopping in Silicon Valley. While Ben's path is impressive, he isn't alone. Teens who are getting a head start on their careers by building something with technology are bringing rise to ethical questions. Should they immediately enter the workforce? Should they be encouraged towards college even though they're already making a ton of money? Those who would see them attend university argue that while they may have the tech know-how, they lack the training in business that will help them continue to make money for the rest of their lives, and avoid getting raked over the coals on a deal that takes advantage of their skills. Does you child have a subject that they rock at? Or are they experienced and old enough that they feel confident teaching first grade math? Have them look at tutoring a younger child. Parents pay tutors big bucks, so even if you child lowers their rates because of their age/experience level there's a real opportunity to make some real money. If your child has an affinity for the visual arts, they could set up an art stand somewhere where people congregate. They can set their rates to charge to paint or draw a picture of passerbys. I'm not going to lie to you; if your child isn't talented at art, this will probably still work. People are suckers for kids who get out there and try. Scrapping metal is killing two birds with one stone. On the one hand, you're saving the environment, and on the other you can make some money for your efforts. Aluminum is one of the most important metals to recycle, as it takes very little energy to reform. Not only is aluminum staying out of dumps when you take it to scrap, but your little one will walk away with a little more money in their pocket. To really make this one profitable, set up a collection with neighbors and friends. Once they know your kid is hustling, they'll likely be more than happy to hand over their recycling. 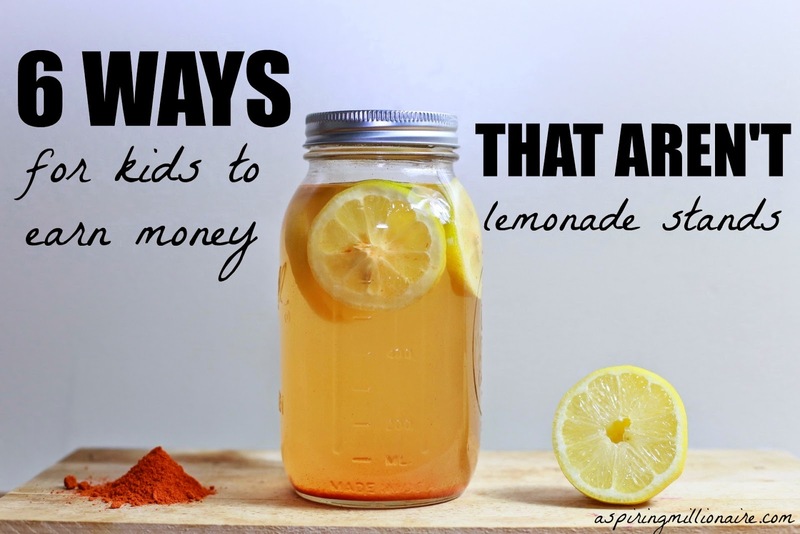 With a little creativity, your child can find something they can do that will net them money. Whether it's something they are passionate about, or just a lesson in hard work, earning that money themselves will make achieving their ultimate financial goal that much sweeter. What have your little ones done to make money? My son has started making money of his love of Minecraft. He makes key chains and sells them online via Etsy. He is 7 and has been posting all over the world. Its been great to talk to him about economics and see him figure out the best way to do things. That is so awesome! And there's definitely a huge market for Minecraft! Cheering for him!